We’re always torn between what kind of a workout we should practice.While some of us love sweating it out in the form of cardio, some of us love lifting. The truth is that you need both, and what better than a workout that fuses the two together? If you don’t have time to spend at the gym (who does?) and want to achieve optimum results out of the little time you have, this workout is your go to. 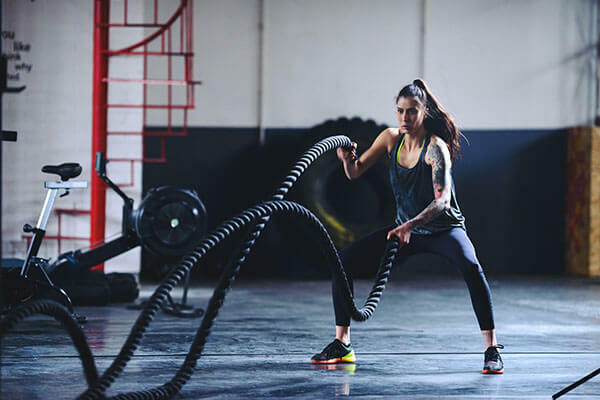 A quick 20 minute battle rope workout that’s divided into sets and reps as advised by your trainer will do the job of a two hour cardio + weight training gym session! This workout works more than just one muscle. Amidst all the leg days and the upper body days where your prime focus is to work specific muscles, this workout will help you work much more than just one! You’re working your hamstring muscle, building core strength and working your shoulders and arms all at the same time! Not just that, you’re also working your abs, back and glutes! Finally a workout that feels like a package! See the video of our favourite Kareena Kapoor Khan slaying with the ropes and acing the fitness game. A battle rope workout is extremely easy to set up, so suppose you’re headed out on a holiday where you’re certainly going to hog onto a lot of food and the guilt of not working out is killing you from the inside, you may have just found your solution! These battle ropes fit easily into haversacks and are very easy to carry, so go on and work those muscles even when you’re vacationing! So now that you know about this unique form of workout amongst other fun workouts don’t hesitate to pester your trainer into making you practice this regularly!